Enterprising pianist Chris Ingham’s latest project takes a look at the work of tenor sax legend Stan Getz through this excellent collection featuring the superb saxophone sound of Mark Crooks. Chris Ingham clearly likes to grasp an idea and run with it. His previous sets have examined the work of Hoagy Carmichael and, less predictably, Dudley Moore. (If you have yet to hear it, listen to Ingham’s Dudley CD as a reminder of Dagenham Dud’s skill as a jazz composer, arranger and performer before his transformation into Hollywood hearththrob.) Unlike Ingham’s two previous subjects, Getz was not a composer and so this disc has a vast range of tunes recorded by the saxophonist over his 45 year career from which to choose. Any mention of Stan Getz will immediately bring out words from aficionados about ‘rich tone’ and ‘Lester Young’, so the choice of horn player is critical. Mark Crooks proves an excellent choice for the role here. From roots at the Royal Scottish Academy of Music and the Guildhall, Crooks has established himself as one of the go-to instrumentalists for the likes of the John Wilson Orchestra. His luscious sound and apparently effortless phrasing suit this repertoire very well, and the recording puts the saxophone front and centre in a most attractive way. The opening Ballad For Leo opens the door to the set very nicely – starting out of tempo with piano flourishes, finding a mid-tempo groove which then doubles into a scurrying shuffle with Crooks riding along, always interesting but never rushed, dropping in the odd double density note in the manner of a footballer nutmegging his opponent to show how much he has in reserve. Horace Silver’s Split Kick shows the band in fine classic swinging form with Arnie Somogyi, surely one our finest bass players, holding down the beat in great form. Getz was a particularly fine ballad player, and slower tunes are well represented here. When The World Was Young is a masterclass in the art of ultra-slow jazz with the band finding myriad ways to keep up the accompaniment without getting in the way of Crooks’ solo. Later in the album Spring Can Really Hang You Up The Most is presented as a sax/piano duet which brought me up short, a startling and finely wrought display of emotional yet reserved music making, economical yet extremely expressive. Many people first heard Stan Getz in his bossa nova collaborations with Astrid Gilberto and Antonio Carlos Jobim. It’s only natural that this album should feature some bossa, and Ingham has chosen well. We don’t get the most well-known pieces, no Desafinado or Girl From Ipanema. Instead the featured tunes include Vivo Sonhando, a Jobim composition from 1962 first recorded by Os Cariocas and picked up for the classic Getz/Gilberto album of 1964. Luiz Eça’s The Dolphin also gets a welcome outing, with George Double’s fine and delicate drumwork offering a shimmering background. Double finally gets to step forward on Kenny Barron’s Voyage for some solo breaks, and Somogyi is similarly rewarded with solo space on Detour Ahead. 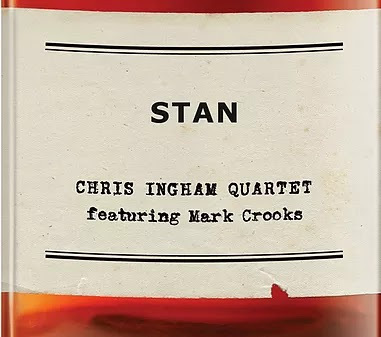 Chris Ingham and his cohort are touring their Stan show this year, so look out for them at a jazz club near you (particularly if you live in Suffolk!). If you can’t see the performance, then this CD is both a fine reminder of the distinguished work of Stan Getz and yet another quality indicator of our fine home-grown talent.